A newly designed homepage on My Aged Care website has been launched for health professionals and consumers www.myagedcare.gov.au. 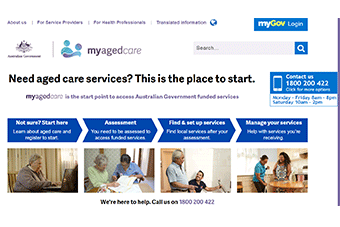 The new home page simplifies navigation pathways, making it easier for people to find the information relevant to their stage of the My Aged Care journey. Recently, a pilot project was also launched to integrate GP desktop software (Medical Director and Best Practice) and streamline the referral process for GPs. Another enhancement is the health professional referral form on the My Aged Care website which now delivers referrals directly to assessors over 70% of the time, with the remaining 30% requiring additional assistance from the contact centre. Where the contact centre is bypassed, an average of nine hours is saved from the end-to-end process for consumers.